MICKLETON — During the East Greenwich Township Committee meeting on Nov. 13, three local police officers were officially recognized for promotions. East Greenwich Police Department Officers Brett Pfeiffer, Officer Dave Forand, and Officer Michael Robostello received promotions to sergeant. East Greenwich Mayor Dale Archer swore in the three officers. In new business, after a public hearing, the Committee established a No Passing Zone on Friendship Road. Earlier in the year they reduced the speed limit on the road by five miles per hour to 35 miles per hour after the engineer completed a traffic study. Also, the Committee approved a five year contract with RICOH for a copier lease. Archer called this another example of East Greenwich getting the best possible deal for the community. Elsewhere, the Committee authorized advertisements for requests for quotations for 2019 professional services and 2019 towing service and vehicle maintenance for the township. They also accepted the resignation of Christopher Everwine as Class II member of the Planning/Zoning Board of Adjustment. An adopted resolution allowed Archer to appoint Sgt. Brett Pfeiffer to the position. 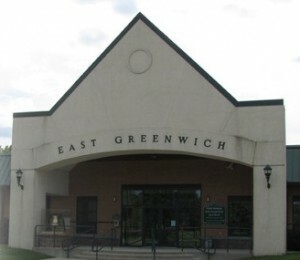 Archer explained that a board member must be a resident and an official of East Greenwich Township. Everwine has resigned as Chief of the Police Department. Another resolution saw the Committee authorize receiving a dividend from Gloucester, Salem and Cumberland Counties JIF as a credit against the Township’s 2019 assessment. One more resolution saw the Committee approve a Commodity Resale Agreement with Gloucester County. “This is a shared service, and it was recommended by our Public Works Manager,” pointed out Archer. The Committee’s top discussion item was the East Greenwich Christmas Tree Lighting event. This year’s lighting took place on Nov. 26 at Thompson Park. The township event featured a large fireworks display. According to Archer, food trucks were present for the lighting, along with members of the local clergy to give blessings, and performances by sixth grade choir Hornet Harmony from Samuel Mickle School. During this meeting Archer said he was looking forward to this year’s event, because the community’s 2017 Tree Lighting saw 2,500 visitors in attendance. At the beginning of the meeting, attendees observed a moment of silence for William H. Beckett, a member of the Senior Services Commission. Beckett was 85, and he died on Oct. 21. “He volunteered his time with the East Greenwich veterans,” Archer said.